And want to learn how to manage, grow and develop an amazing and anointed ministry that reaches and ministers to people? An EXCELLENT Dance Ministry Starts with YOU! This Master Class workshop comes to YOU! 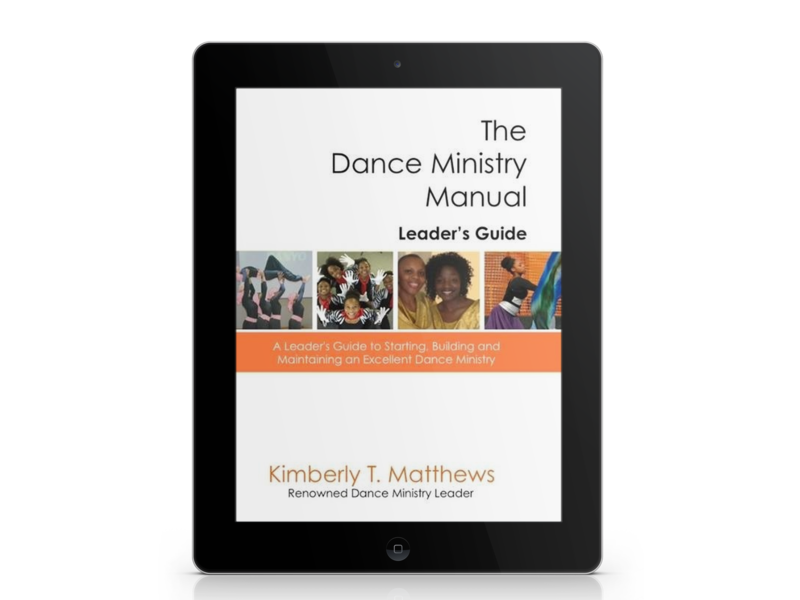 The Dance Ministry Manual Training Program is a 4-week online program comprised of bible-based, comprehensive, online video modules combined with downloadable worksheets that allow YOU to take ownership of the development of your ministry team, and lead them to excellence. Enroll in The Dance Ministry Manual Online Course and take your dance ministry from under-developed to AMAZING for the Glory of God! YOU be the leader. We'll show you how. When you enroll, you will have IMMEDIATE access to our online training modules so that you can get started on the course right away. New modules are released weekly for 4 weeks, and consist of easy-to-follow videos and downloadable worksheets to support each lesson. All of the training is contained in the private area of the participant site and is for enrolled participants only. The training is self-paced, so there is no way you can fall behind. Included with enrollment, participants can connect with other ministry leaders in an exclusive Facebook group to compare notes, ask questions and virtually fellowship. Plus, enrolled students have life-time access to the course material. Sometimes life gets in the way and you have to shift your priorities. No worries! You can complete the course at your own pace, and retake or revisit the modules when ever you need to, as long as the program exists. It's not for everyone . . . If you have a well-established ministry with fully developed, effective and functional processes, and you are content with your level of ministry service, this program is not for you. If you are looking to develop mesmerizing dance technique this training is NOT for you because it is not physically focused. While there are LOTS of activities built into the training, and even physical exercises you can implement and take to your team, this is not a technique class. If you are looking for a program with the fanfare of a formal graduation ceremony and diploma, this program is not for you. Because the training is self-paced and there is no demand for your to turn in course work, or attend calls and/or make arrangement to attend any live event, we cannot assess if you actually completed all assignments. If you are only interested in a traditional workshop that provides you with a few tips, a little choreography, and a large focus on an end-of-program concert, this training is not for you. The training focuses on intrinsic development and practices for your team, from structuring it so that it will function efficiently to ministering in excellence. YOU can take YOUR dance ministry to the next level! Just enroll TODAY and get started right away! Kimberly is a published author, professional content editor, ghostwriter, online course developer and multi-passionate creative entrepreneur with more than 20 years in the publishing industry. Pick a Shape - How about Round? Number 27, You're Up Next! And Five, Six, Seven Eight! Dance Doc - Practice Makes Perfect! Dance Doc - Be Expressive! Take it to Your Team - Did You See That? Add a Little Something To It! Creativity Builder - One, Two, Three - Red Light! Dance Doc - One, Two, Three - Red Light! This course is very. Informative and easy to understand and apply. I am taking in alot and my eyes have been opened to new ideas of growth and some insights of my team that I had a blinding eye to. Thanks so much to be willing to share this blessing!